Although the boom in historical fiction and historiography about Spain’s recent past has found an eager readership, these texts are rarely studied as two halves of the same story. With Genre Fusion: A New Approach to History, Fiction, and Memory in Contemporary Spain, Sara J. Brenneis argues that fiction and nonfiction written by a single author and focused on the same historical moment deserve to be read side-by-side. By proposing a literary model that examines these genres together, Genre Fusion gives equal importance to fiction and historiography in Spain. 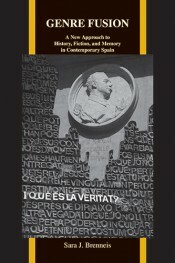 In her book, Brenneis develops a new theory of “genre fusion” to show how authors who write both historiography and fiction produce a more accurate representation of the lived experience of Spanish history than would be possible in a single genre. Genre Fusionopens with a straightforward overview of the relationships among history, fiction, and memory in contemporary culture. While providing an up-to-date context for scholarly debates about Spain’s historical memory, Genre Fusion also expands the contours of the discussion beyond the specialized territory of Hispanic studies. To demonstrate the theoretical necessity of genre fusion, Brenneis analyzes pairs of interconnected texts (one a work of literature, the other a work of historiography) written by a single author. She explores how fictional and nonfictional works by Montserrat Roig, Carmen Martín Gaite, Carlos Blanco Aguinaga, and Javier Marías unearth the collective memories of Spain’s past. Through these four authors, Genre Fusion traces the transformation of a country once enveloped in a postwar silence to one currently consumed by its own history and memory. Brenneis demonstrates that, when read through the lens of genre fusion, these Spanish authors shelve the country’s stagnant official record of its past and unlock the collective and personal accounts of the people who constitute Spanish history. Sara J. Brenneis teaches a diverse array of courses on contemporary Spanish culture at Amherst College. She has published scholarly articles in journals such as the Bulletin of Hispanic Studies, Letras Femeninas, and History & Memory on the overlapping of history and fiction in Spanish literature. Brenneis’s current work focuses on issues of historical memory in Spanish representations of the Holocaust.